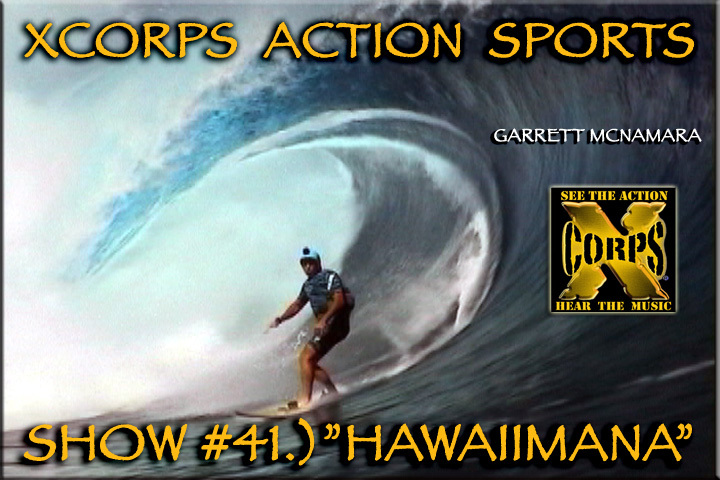 The Xcorps TV production team goes BIG ALOHA with host Jason Lazo back in the Hawaiian Islands reporting on a mix of cool action sports eXtreme fitness events sponsored by mega nutrition maker HAWAIIMANA producer of the HawaiiMana Sports Challenge. This XCTV show episode goes BIG with wild surf video of tow in surf gunner Garrett McNamara outrunning locomotive waves at Jaws Hawaii and Teahoopu Tahiti backed by charging tunes from California ripper band MOWER – Hang on! Mellow islands scenes and tunes here too with sweet Oahu Island shots with rainbow framed beaches under waving coconut palms…So Ono! XCTV show host Jason Lazo introduces members of team HawaiiMana training on the Waimea Beach Park and UNDER the nearby water! See these young surf trained athletes demonstrate Hawaiian island style method of building strength and lung power using just… a big rock…Underwater! Spectacular nature shots here of turtles and fish in their element rolling with a cool mixed music soundtrack of irie tunes from reggae ‘Electric Avenue’ pop master Eddy Grant. In the next XCTV segment the action and music continues with Jason going from SCUBA gear to an island outrigger canoe charging a Waikiki wave and then on to other side of Oahu to hang at the Hawaiimana beach crib! Up next Xcorps cameras roll at a secluded North Island beach with Hawaiimana surf by team members Alisha and her Dad the Davey Boy Gonsalves, Jason Miller and sister Oleema Miller heading out to catch some rides. 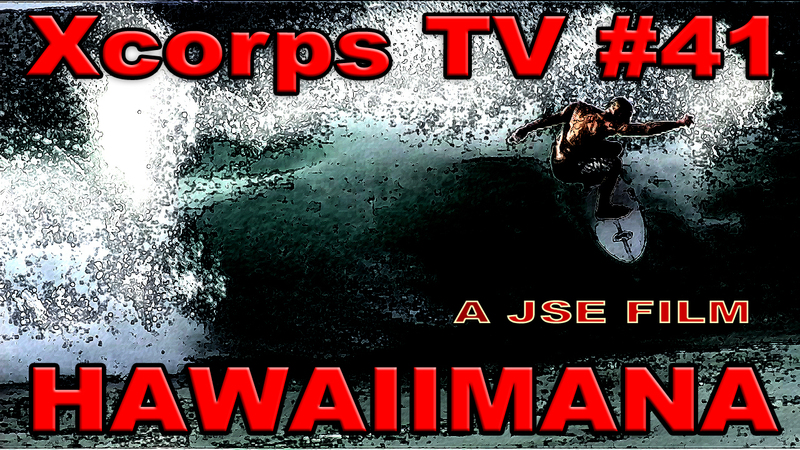 This special Xcorps aloha Hawaii show continues with the X cams traveling down the beach to surf heaven at a place called V LAND to catch rising NSSA surf championette Carissa Moore carving and ripping! Jason talks to Carissa on the V Land beach for a little XCTV interview. See how this rising star athlete Carissa Moore gets her training done and hear her fun laugh while doing an Xcorps stay tuned ‘Thro’ and hear more smooth tunes from Eddy Grant. Then it’s back to Garrett towing into another massive thunder water tube followed with a smooth exit rolling tight with music from artist Eddy Grant and his tune ‘Reparation’. For lunch Jason grazes over some local flavor – Spam and Seaweed – then crosses the island to meet with open ocean stand up paddleboard master Aaron Napoleon who leads the Xcams offshore to the turbulent Molokai Channel for a look at this emerging challenging sport! To get these shots of Aaron Napolian riding his paddle board inside the Molokai channel was akin to shooting in a washing machine on heavy scrub…the boat rolling with the big swells as Aaron paddled his 15 foot board up and down the dark blue victory at sea swells all captured for our viewers in HD! Fresh music video from San Diego musical artists My American Heart doing their song ‘The Shake’ powersing up this video segment! Everyone on board the chase boat was hanging tight as Aaron paddled the huge water! Jason talks with the HawaiiMana ocean man back at the boat. See what Aaron says about the ride and the ocean conditions! The next segment in this XCTV episode rolls back to the shoreline to catch fitness man and the voice of Hawaii Joe Teipel surfing Sandy’s beach in style! Jason talks with the this waterman about HawaiiMana and the island spirit of Aloha. Cool shots of the famous Halona blowhole going off here too! The show closes out with Jason back in SCUBA gear cruising below the waves and a memorable palm tree framed golden beach sunset near Diamond Head Oahu Hawaii! Jason talks with HawaiiMana girl Kristin Austin doing some healthful YogaYoga moves. 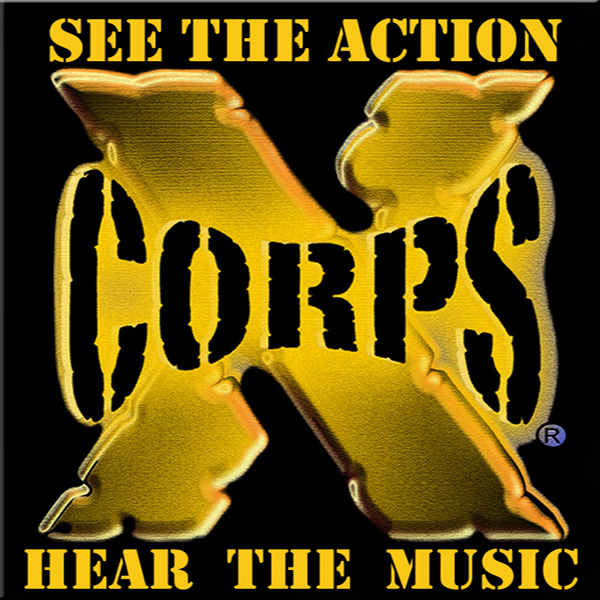 Just another day in paradise on The Xcorps! Stay tuned for more fun in the sun future episodes covering training for the HawaiiMana Fitness Challenge in Hawaii. Special thanks to Hawaiimana Nutrition Dave Ohlson and Jim and Kristin Austin and Genie Joseph in this show. Also thanks to Davey Boy Gonsalves, Jason and Oleema Miller, Carissa Moore, Garrett McNamara and Kealii Mamala, Aaron Napoleon and Joe Teipel in this production. Music from RIVE promotions and Eddy Grant. *Xcorps TV Production Tip #41. – Please DO It Tip Coming Soon! JSE/XCTV *Xcorps TV Production Tip #41. – Please DO IT!